Debuting their unique amalgam of soul, jazz, pop and some blues to the homegrown music scene is The Steve McQueens. 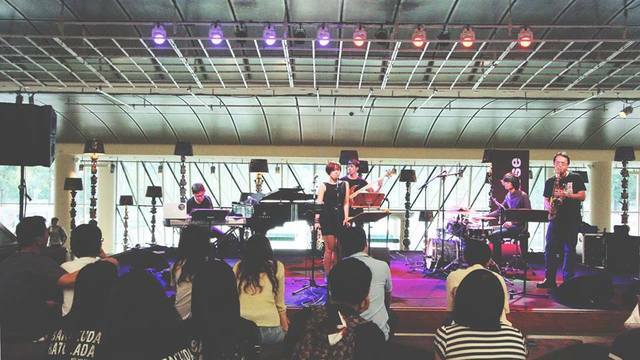 They recently released their album Einstein Moments at Blu Jaz Cafe last week, which we're sure will be on spin a lot. We talk to this NeoVintage Soul outfit about their beginnings, their own einstein moments, and their influences. Hi guys! Introduce yourselves and tell us about how the band came to be. JOSH: The band is a really new entity! We only just got together in April this year. Since then it’s been a crazy few months. We’ve played tons of one-off gigs, landed a steady regular gig at a really nice place, had a change of personnel, lost a guitarist and bassist to NS, wrote and launched an original album... tired but happy are we! Basically we all knew each other from the music scene, and through Lasalle College of the Arts where I teach. In March this year, some of us went to Jakarta for the Java Jazz Festival. We were so inspired and challenged by artistes like Roy Hargrove, Joss Stone and Jose James, all playing on the same stage, that we decided when we got back we would get together and write music that inspired and challenged us. Eugenia, Ben (our original bassist) and I were already working together at the Oriental Hotel as a jazz trio; so with the addition of guitarist Marcus Szeto and veteran percussionist Bobby Singh, the Steve McQueens did their first ever gig on April 23 2013 at the Sultan Jazz Club! Later, Jase and Aaron replaced Ben and Bobby for various reasons and saxophonist Fabian Lim joined us. Explain 'NeoVintage Souljazz' and what it means to you. We describe our music to be NeoVintage Souljazz - it's a meeting point between the traditions of jazz and what we interpret contemporary music to be. How did you come up with the name of the band - are you guys fans of Steve McQueen? J: Music to free the soul: the expression of emotion thru music as a means to liberate oneself: a cool and somewhat lofty ideal, but one we truly believe and practice. Steve McQueen (the actor) was the icon for cool in the 60’s and 70‘s. His anti-hero persona, together with iconic films like The Getaway, The Great Escape and Papillon made him immediately relatable to us as the anti-establishment escapist; plus “The Steve McQueens” sounded so much better than “The Phaser-Beam Band”! Tell us about the recording of the album Einstein Moments; was it an intensive few months? GENIA: Recording the album was a fun process; all of us got into the studio (Beep Studios) with the help of Stu Robert Wee as the sound engineer and recorded our tracks together. We learnt that we really love McDelivery (especially at 1.30 AM) and that Fabian, our saxophonist, knocks out by midnight as he gets up extremely early in the morning for his day job! And also that most of us do not function well before 2 PM. Hahaha. So now we kinda just stick to our optimum time periods for recording or rehearsal. Any main themes in Einstein Moments? G: The album title Einstein Moments came about when we were writing the track "Walls". Joshua and I were working on this line that we really liked but couldn't find a part to place it in nicely... you know, we tried to play it before/after the verses or choruses etc etc. So all of a sudden we were like "ok, let's try this between the choruses. Right in the middle!". We tried it... and it worked and we got so excited we gave ourselves a standing ovation in the studio. Together with joyful yelps and shrieky jumps. It was just a really funny and enlightening moment we had. So THAT became our Einstein Moment. It's really about finding joy in the smallest of things that we do. It later became our album title and the theme that we wanted to carry across in the album. Did you guys have a song or album that you listened to throughout the recording of the album? G: We listened a lot to a few of our favourite musicians like Robert Glasper (Black Radio), Darryl Reeves (Mercury) and Jose James(No Beginning No End) while recording/ writing the material. There wasn't much of a particular track per se..
To us, this album has the sort of groovy, blues/soul infused sound that is not common in the scene right now. What do you hope to achieve with your music? G: We just want to be happy playing the kind of music we play and enjoy best.. and you know, hopefully, it inspires our listeners to do what they've always wanted to. It's really about staying true to what you believe in. Well of course it'd be awesome to see our audience/listeners groove and dance to our music - all 100,000 of them. Haha! You've described your sound as 'eclectic' - is there a direction that The Steve McQueens would like to experiment with next? G: Well... That really depends. We're a bunch of people who listen to and are influenced by different sub genres of this musical style.. And the music we write comes from what we feel at that particular point of time.. So there's no telling what we'd be experimenting with next! It keeps us excited (really excited) and on our toes each time we jam something new! Where do your influences come from? J: We describe the band’s sound as neovintage souljazz. This references the obvious neo-soul influences of D’Angelo, Erykah Badu, Lauryn Hill and Maxwell, as well as the more ‘open’, improvisational approach of modern jazz instrumentalists like Robert Glasper and Darryl Reeves. Combine that with the ‘vintage’ Soul/ R&B sound of icons like Stevie Wonder, James Brown and Bill Withers, and you’ll be in the Steve mcQueen ballpark. Just think groove, groove, always Groove!